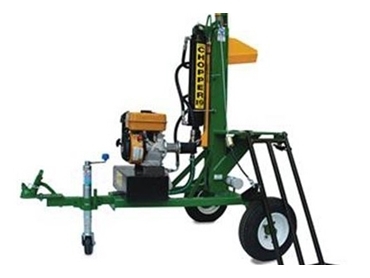 The Aussie Chopper WS100 is the smallest hydraulic log splitter in the range from Whitlands Engineering . Perfect for splitting domestic volumes of firewood, the Aussie Chopper provides a safe, easy to use and tough as nails service to it’s user. The log splitter is fitted with a 6hp engine and a 100kg capacity cable operated log lifter making the Aussie Chopper a very powerful tool. With the on command control system, the 6hp engine can deliver a splitting force of up to 19 tonnes and a cycle time of 14 seconds. With a patented blade design which helps with splitting performance, vertical sliding actions also accommodate different lengths of wood up to 450mm. The Aussie Chopper is also safe to use aided by the single handed control system that keeps hands away from the moving blade. The Chopper also has a two year warranty on all parts and construction as well as a 3 year manufactures warranty on the Subaru robin or Honda engines.